Get Help with Your Down Payment! Down Payment Assistance for Houston Area Home Buyers! Whether you are looking to buy your first home or have owned a home before, there are several options to access down-payment help if you’re buying a home in Houston or Harris County. Imagine how great it would be to get help with your down payment! I have worked with many home buyers – including those who previously owned a home – who were unaware of these great programs that can help you get into a home. Each has different options and requirements — we can talk about those together. I have great relationships with lending partners who can go over the details. It’s important to explore your options early because applications and getting everything approved is not an instant process. One TV commercial wants you to believe an “8-Minute Fast Mortgage” is for everybody. It just rarely works that way. It can literally pay you to take a little bit of time to learn about these home buyer assistance programs that can save you thousands of dollars! If you’re thinking of buying in the next 3 – 12 months or so, you’ll have time to know your options, get everything in place, and get started with the financing process early so you know the price range and options you have when we search for your ideal home! Discovering all the possibilities now can give you certainty of what you can do and perhaps even put you in a stronger position as a home buyer! I love learning about programs that help my clients get into their new home! I’ve recently delved into the details of the TSAHC (Texas State Affordable Housing Corporation) program. I’m excited to share that the TSAHC Home Sweet Home Program is a fantastic option for millennial and Gen-X home buyers looking purchase your first home. One program helps you transition from Renter to Buyer. If you meet the guidelines, you may be eligible for: Fixed Rate Loans with Down Payment Assistance (DPA) with several mortgage rate, loan and DPA options are available. Down Payment Assistance can be up to 5% of the total loan amount! Let me know if you are interested in this program and we can get you connected with a lender certified in these special down payment and mortgage financing assistance options. Buying Now and Have Not Owned a House in More than 3 Years? Check out this Tax Credit! For first time buyers or those who have not owned a home in the last three years, there are Mortgage Credit Certificates (up to $2,000 every year as a special income tax credit) that can be used with TSAHC’s Down Payment Assistance. You do not need to be a first-time home buyer for Down Payment Assistance programs. One of the big questions I hear about these programs is, “Do down payment assistance programs slow down the buying process?” If you are working with the right Realtor and lender and have your paperwork lined up, it does not take any longer than a traditional mortgage. Are you a teacher, veteran, police officer, corrections officer, or firefighter? We need to talk! There is a special program called Homes for Texas Heroes that TSAHC offers that is not as well known as it should be. This program features different 30-year mortgage rate options, Down Payment Assistance, and a few other special features. Each of the careers mentioned above has different requirements to qualify. Let’s quickly talk about the qualifications and see what fits you best! You do not have to be a first-time homeowner to take advantage of this program. These are just a few of the many great financing options for Houston area home buyers. Before you search online for different rates or prices, let’s talk about what will work best for your situation. Working with a Realtor and a lender earlier in the buying process saves time down the road. If you’re thinking about buying a home in the next 3 – 12 months, let’s explore the best options available to you! Message me via Facebook or call me. 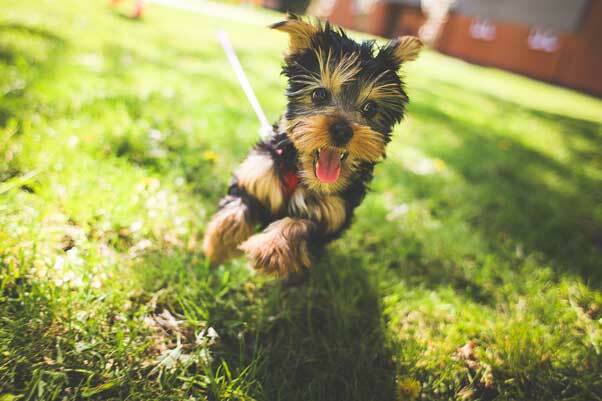 Doesn’t that adorable puppy in this post’s feature photo look like a really happy pup that’s loving his new yard?